Paschal Donohoe says he’s prepared to use his influence as a shareholder if he’s not satisfied with how banks perform. THE JOBS OF individual bank directors could be at risk if they do not deliver on the timeline to compensate customers of the tracker mortgage scandal. The State has a majority stake in AIB and PTSB and a minority stake in Bank of Ireland, so any influence and pressure the minister can exert is only relevant to these banks. Last week, Finance Minister Paschal Donohoe met with the CEOs of the major banks to “admonish” them and their “disgraceful” behaviour. A timeline for when affected customers would be repaid was agreed with government and it was announced that two reports on the scandal and on the culture within the banking sector are to be completed. 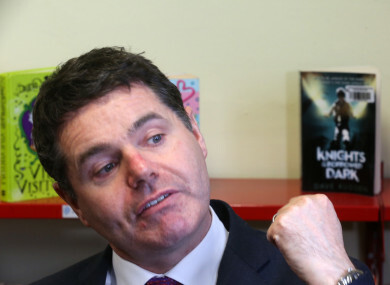 Donohoe said he would be holding the bank bosses “personally responsible” for resolving the situation that saw thousands of bank customers wrongfully taken off or denied a tracker mortgage. While the minister ruled out removing a bank’s board in its entirety, stating that boards need to be in place in order to meet requirements under company law, he said options are open to him in terms of removing individual directors. “There are many actions that will be open to me next year if the matter is not resolved, including pay, in terms of the tenure of individual directors, and including my role in corporate resolutions,” he told reporters yesterday. He said he was “willing to do any or all of them if the timelines and actions committed to” fail to be delivered upon. Using his influence as a shareholder in AIB, PTSB and Bank of Ireland, the minister can move to remove directors from the board at banks’ Annual General Meetings (AGMs), where directors are appointed. A statement from the Department of Finance said that if the Central Bank deemed that the progress made on the issue had not been sufficient or acceptable, there were a range of possible policy measures available to the minister including “targeted activist actions as a shareholder in three of the banks consistent with the protection of the taxpayers’ investment over the medium term”. It added that the “tenure for directors” is an area the minister could target and that would be consistent with activist actions open to him as a shareholder. As a shareholder in Bank of Ireland, PTSB and AIB, Donohoe said he can also move to restrict bankers’ pay and bonuses. Transport Minister Shane Ross said the Independent Alliance stood by its remarks last week that they would prefer a Garda investigation into the scandal. However, the minister said he would not be pushing the matter, and that he was content to see how the current investigations progress. Whether the gardaí get involved is a matter that will “be determined by the report by the Central Bank”, Donohoe said last week. At the announcement of a raft measures into the government’s plans to clamp down on white-collar crime, Ross said the banks had been “a constant thorn” for the last ten years. “We would be very happy to support any further measures” on tracker mortgages, said Ross. We support totally what the Minister for Finance has done so far, but if he finds that the banks are wanting, in any way, we will fully support any measures he takes as a shareholder, including taking decisions to remove directors. The Independent Alliance are “100% behind this drive”, Ross said. It’s believed the number of customers impacted by the widespread scandal could reach more than 30,000. Email “Minister's warning: 'Tenure of individual bank directors' in firing line unless there's progress on trackers”. Feedback on “Minister's warning: 'Tenure of individual bank directors' in firing line unless there's progress on trackers”.